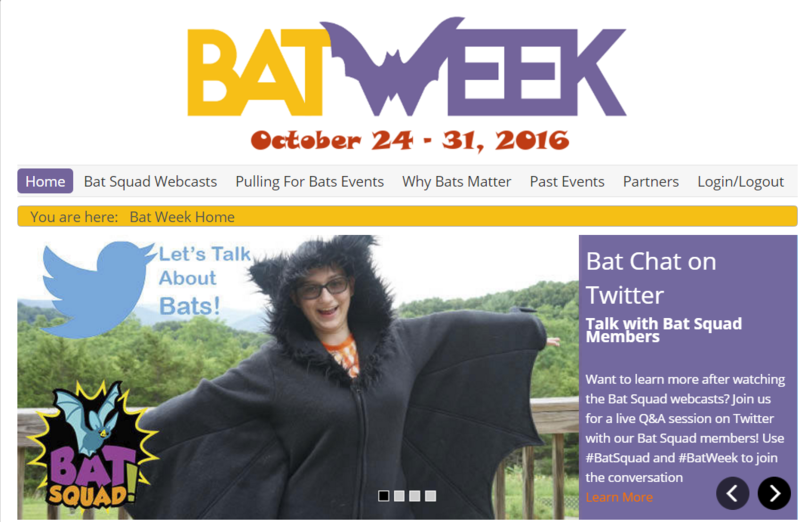 Baturday News is a weekly blog written by Rachael, a high school student, bat advocate, and Save Lucy volunteer. Rachael’s interest in bats was sparked by the big brown bats that used the outside of her former home for a winter roost. Rachael has been writing the Baturday News for over three years. Hi everyone! I hope you all had a good week! I am very happy to announce that Bat Week starts tomorrow! 😀 Think batty thoughts! I am very excited because Bat Week is a perfect way to end Bat Appreciation Month. The bats at Save Lucy are all very happy too. They think they deserve extra mealworms to celebrate the special occasion. I think they’re right. In honor of Bat Week, there are a lot of events scheduled around the country. Actually, I think there are batty events scheduled all over the world! One of my favorite events will be the airing of the Bat Squad webcasts. The first will air Tuesday, October 25 at 1:00 and the last one will be Friday, October 28 at 1:00. All of the webcasts will be followed by a 15 minute Q&A on Twitter. These Q&A sessions will feature all the members of Bat Squad. I will be on Twitter on Friday to answer questions. Please watch these webcasts! I think it’ll be a lot of fun! My other absolute favorite event will be at the US Botanic Gardens in Washington, DC on Saturday, October 29 from 10:45-4:15. The Bat Squad webcasts will be shown throughout the day. There will also be Q&A sessions after each showing. But the best part of the day will be Mrs. Sturges and the bats! That’s right, Mrs. Sturges, my friend, mentor and president of Save Lucy, will be there too! With BATS!!! It’s going to be a wonderful and fun filled day. Please come join us if you are in the area. I hope to see some of you there.